The Brighton bike share scheme is expanding with 120 more of the distinctive light blue bicycles expected to be in use this month. The expansion – to 570 bikes – comes as the operators were celebrating a million miles of cycling since the Brighton scheme started on Friday 1 September 2017. And the scheme, branded BTN BikeShare, will also offer more hubs – with the latest in Rottingdean after docking stations were installed in Preston Street, Brighton, and Connaught Road and Portland Road, in Hove. There is also a “virtual” hub at Portslade station giving cyclists more than 60 places to start and end a ride. Almost 70,000 people have hired a bike over the past 19 months making more than 560,000 trips. BTN BikeShare is operated by Hourbike, which runs similar schemes around the country, in conjunction with Social Bicycles (Sobi), which is owned by Ubere and responsible for the app. 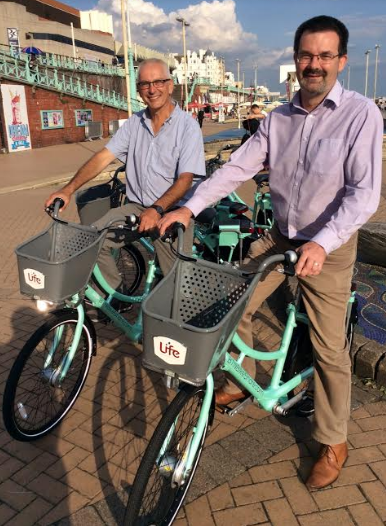 Hourbike boss Tim Caswell said: “We’re thrilled to be expanding BTN BikeShare and hope that it will encourage even more people to cycle in and around Brighton and Hove. light blue? they are light green?